And our unique deal packaging JV opportunity! Watch the short video below for more info! 0:13 What is Deal Packaging? 0:35 Why is deal packaging such a great strategy? Is John Wilson of Property Investment Blueprint? 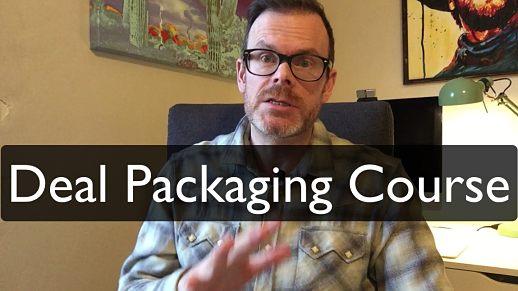 And in this video, I want to talk a bit about our deal packaging course. So, deal packaging, as you probably are aware, if you are searching for deal packaging courses is a strategy, which is all about finding property deals -- usually discounted property -- and packaging it on to another investor for a fee. Deal packaging is a fantastic strategy. It's it's great if you're just getting started. If you're trying to get into property. If you don't have much money to invest, then it's a quick way of doing that, and generating some nice fees for yourself whilst also at the same time, building up a network of property contacts and building trust with investors that could turn into joint venture partners later on, at some point down the road. So that's deal packaging as a business model. Now, our new deal packaging course is called Guerrilla Deal Packaging. It's a comes in the form of a digital manual and series of downloads. Now, what our deal packaging course has that many deal packaging courses don't have, is a specialised deal packaging website, that you can customise to your own business. Now, why is that important? Well these days, you know, what's the first thing you do when you want to do business with a particular company? You Google them or you go onto their website, don't you? Now, if we're talking about something that is a large investment that an investor is going to make with you, then how much more are they going to be wanting to look at your website, right? They need to know that you are credible, that you mean business, and the best way of doing that is by having a website. We have our website included with our membership, our deal packaging course membership, and that's so important. So that's a specialist website. You can showcase your deals in there, inside are private members, you know password protected area. That's important because you know, you can't have mortgage companies finding the deals just floating around on the internet. So, it's password protected. And you can also build your investor list. So if you have your deal packaging website on your business card, then people can go there and they can sign up and join your mailing list and the benefit of that is the when you get a new deal, you can then just put together an email about that deal and then send it out to your investor list. It's just a fantastic way of working so that's something we have that most deal packaging courses do not. Next, we will cover things like how to select your gold mine area. Now you may know this already, but if you don't, we're going to cover how to select the geographical area that you're going to be investing in. That's important, because if you choose the wrong area, then you may not find that there's not enough deals or not the right type of deals in that area. So that's important to get nailed down. Now after we look at the area, we're going to be looking at how to actually source these properties. So we have our course called Guerrilla Property Marketing, which is a video course all about how to get in touch with, or rather, have motivated sellers contact you. Which is a great way of working, rather than chasing after people who are selling their properties, you can get them to contact you. That's all we cover in Guerrilla Property Marketing. So the next thing is Deals on Demand. This course is a video course all about how to deal with motivated sellers. Once they contact you, it's important to know how to speak to motivated sellers. Getting in touch with them is all very well, but to get the deal, you need to be able to build rapport with them. You need to be able to gauge if they are actually genuinely motivated. You need to be able to position yourself as the person who is going to solve their problem, by creating a win-win solution for them. So that's all covered by Deals on Demand. And the core of that is centred around our telephone scripts. And these are phone scripts that have been battle tested over the years and they've got all the language patterns in the psychology that's built in there, to do everything that I just mentioned and set you up to to do the deal. Okay, so what else do we have in our deal packaging course? Well, there's a private Facebook group. I'm in there, obviously. There's a bunch of other investors in there too. You can ask questions directly of me, and for people who are not on Facebook, there is email access as well, because I know not everyone is on Facebook. The Facebook group is great because you can network with other investors. You can perhaps do joint ventures. You can trade your deals, all in that private environment. Okay, now something else, which is very, very valuable is the joint venture opportunity. Now, this is great if you're just starting out, and you may not have a very large investor list and if you get a great deal and you're not able to find a buyer on your own then what you can do is you can come to us and we will work with you to find a buyer within our contact list. Okay, and we'll do a joint venture on that. So that's an excellent thing to have; just gives you the confidence that you are going to be able to sell your deals. There's obviously no guarantees. But if it's a genuinely good deal, then the chances are we'll be able to find a buyer together. Okay. So everything I just described is available for a low monthly subscription. And remember you get access to everything I've spoken of, you get your website, Facebook group, the joint venture opportunity and all of that, and to be honest most people are surprised by the amount of value that they get for the price that you're paying. There's a few unexpanded unexpected bonuses in there as well. So you can check it out completely risk-free because there's a 30 day money back guarantee. So go in there check everything out, if you don't like it, then simply contact our support and we will give you a full refund within 30 days. Okay. So check it out via the link or a button below this video, or in the description if you're watching on YouTube and you can go through and find details about our deal packaging course. So this has been John Wilson of Property Investment Blueprint. Thanks for listening. See you next time.